LOCATION.--Lat 42°57'26", long 77°35'20" referenced to North American Datum of 1983, Monroe County, NY, Hydrologic Unit 04130003, on right bank 25 ft downstream from bridge on State Highway 65 at Honeoye Falls, and 15.3 mi upstream from mouth. PERIOD OF RECORD.--October 1945 to September 1970, October 1972 to current year. REVISIONS HISTORY.--WDR NY-82-3: Drainage area. Datum of gage, prior to October 1970, was corrected on November 7, 2017. GAGE.--Water-stage recorder. 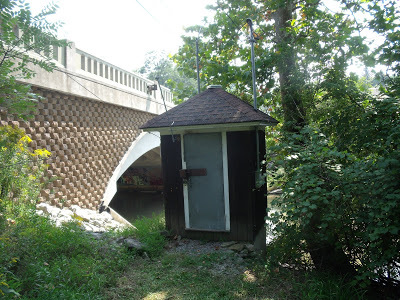 Datum of gage is 608.00 ft above NGVD of 1929 and 607.49 ft above NAVD of 1988. Prior to October 1970, at same site at datum 609.75 ft above NGVD of 1929 (609.98 ft, levels by U.S. Army Corps of Engineers). Prior to Apr. 1, 2019, at datum 2.00 ft higher. REMARKS.--Outlet of Honeoye Lake not controlled. Some diversion from and regulation of Hemlock and Canadice Lakes for water supply of City of Rochester. Prior to 1967 water year, published monthly figures adjusted for change in contents in, and diversion from, Hemlock and Canadice Lakes. Prior to about 1960, diurnal fluctuation at low flow caused by mills upstream from station. EXTREMES FOR PERIOD OF RECORD.--Maximum discharge, 4,800 ft³/s, May 16, 2014, gage height, 7.63 ft, present datum; maximum gage height, 8.17 ft, Mar. 28, 1950, present datum; no flow, Aug. 12, 15, 2001. EXTREMES OUTSIDE PERIOD OF RECORD.--Flood of June 23, 1972, reached a stage of about 8.3 ft, present datum, discharge, about 6,600 ft³/s, from rating curve extended above 3,300 ft³/s.